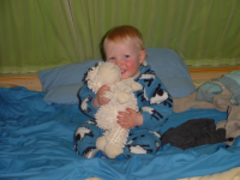 Cuddling the sheep in the caravan. A fairly quiet month after all the excitement of the festive season. Euan had his MMR jab at the start of the month. Although he didn't mind too much at the time, he was quite poorly a few days afterwards. Mummy and Daddy discovered semi-digested blueberries make quite a mess!! A month of ups and downs! Everyone had bugs of one type or another but only Mum managed survive without antibiotics. Thankfully everyone is fully recovered now. We found a Valentine's card in Euans bag - we're not sure who the recipent was going to be but it was very nice ...and he had decorated some heart shaped biscuits. Daddy has a new job - he is 'technical helpdesk agent' on behalf of BT Business Broadband - he's is really enjoying spending all day fixing computing problems over the phone. Mum had two weeks holiday on February - she was really meant to be using the time to get on with her latest Open University course, but not a great deal was done!! Sad news this month too - Rodney(aka 'that damned cat') is now chasing mice in Heaven ... quite strange really as he never did that when he was on Earth!! At 18 years old, he'd had a good life, we are saving a fortune in cat food, but we will miss him. Spring has arrived and the frogs in our pond (8 of them!) have filled it with frog spawn -obviously the heron which visited last month didn't manage to feast on all the amphibious creatures in the garden. Euan and Mum spent a few days in Belford in the middle of the month with Granny Maureen and Jack. We had great fun and did some visiting too. Unfortunately Euan slept through most of his visit to the treehouse at Alnwick Garden. Euan had been very busy in preparation for Mothers Day - managing to make two cards and buy another...Mum was very pleased. Everyone from the farm came for lunch on Mothers Day - Euan really enjoyed have Kate, Fay and Angus to play with. Euan has another two teeth and is still putting them to good use for munching food. He has even started having an attempt and spooning his own dinner in. Success has been erratic and the carpet now has it fair share of food stains! Another developmental milestone this month! Euan finally realised that he could get around on two feet without holding on to the furniture. From the first few faltering steps, he has become very confident about walking. He has his first pair of proper shoes (complete with flashing lights in the soles) which are a great hit. The better weather this month has meant that we have been able to get outside a bit more. Euan enjoys exploring the garden - checking on the tadpoles in the pond, giving the cherry tree a good shake and looking for daisies in the grass. We had a trip up to Stanley one afternoon to watch Dad do some canoeing. Euan had a seat in the kayak and looked quite at home there, but it will be a little while before he's afloat. Euan had his first visit to the Links Market. It was very busy and a bit noisy, so he was slightly overawed by the experience. He did go on the spinning teacups with Mum ....both of us enjoyed that! Euan is becoming quite chatty these day too - 'hiya' is definately a favourite work and is shouted at anyone who cares to listen. 'Bye bye' and waving is also put into practice at appropriate moments too. We decided to have a holiday at the beginning of May to enjoy the spring weather. Unfortunately the weather had it in for us and we had a wet and windy few days in the caravan. However we did have good fun (although the Elie Chain walk was possibly a little adventurous for a small child in a backpack!) Euan enjoyed being in the caravan though as there were a multitude of cupboards to explore. Grandad Peter and Flora came to visit in mid May. Euan entertained them very well and I'm sure there are many photos of him on their way back to Thailand for the grandparents to show off. Euan was a little bit poorly towards the end of the month with an ear infection. Thankfully another bottle of yellow medicine has cleared it up and he is back to his normally happy self. Euan has also mastered using his own set of cutlery and happily feeds himself at mealtimes...at last Mum and Dad can have their meals whilst they are still warm. Euan had a few changes to his routine this month as Karen, his childminder was taking holidays. Granny Maureen and Jack, bravely volunteered to come up for a few days to look after him. Everyone had a great time even if they were all exhausted after several trips to the park. Euan also spent a few days with another childminder named Julia. He enjoyed being at her house and seeing the cats and dog who live there. August has been an exciting month for Euan. He has moved into the 2-3 department at nursery. We're concerned that the other children may go hungry, as lunch in this department is self-service. Euan and Mum went off to Cornwall to visit Auntie Margaret in the middle of the month, leaving Dad to fend for himself and enjoy the peace and quiet. It was Euans first time in an aeroplane which he really enjoyed but he did get a little bored with the safety demonstration. We had great fun on holiday, paddling in the sea, eating blueberries and apples from Autie Margarets garden and sampling some Cornish Pasties. Cousin Helen and Baby Oliver were there at the same time too. It was lovely to see then, although Euan wasn't too keen on Olivers attention at times. Euan has had his first haircut - just a trim, but at least he doesn't get annoyed with it being in his eyes now. Mum entered the Errol village show at the end of the month - delighted to win first prize for her clootie dumpling this year again. We've had some lovely weather in September so we've made them most of getting out and about. In the middle of the month we had a fabulous holiday with Granny Maureen and Jack, across in Argyll. The weather was exceptionally good and our cabin very comfortable. We really enjoyed having a hot tub - Euan was especially keen on the 'outside bath'!! We even had a friendly robin which came to visit each day. We popped down to the farm one weekend and were lucky enough to see a member of the hedgehog family currently living in the garden.....but didn't spot any of the mice which have been scaring Auntie Rosemary in the house! Euans vocabulary continues to expand and he's still eating lots of food! Following a quick visit to Belford Euan has his first pair of wellies this month too - looking forward to splashing in the puddles! Euan is becoming quite a chatterbox these days with lots of new words - he enjoys having a chat on the telephone! Euan enjoyed two Halloween parties at the end of the month. Mum made him a little red devil outfit, and Daddy carved a fabulous pumpkin lantern. We were treated to Euan wishing us "Happy Halloween" for days! Birthday month!! Euan celebrated his 2nd birthday this month...he can officially have tantrums now. He had lots of lovely presents and particularly liked his birthday balloon from Karens dog, Nacho. Granny Maureen bought a very tasty caterpillar cake for us all to have to celebrate. Shetland Granny came to stay for a few days.They entertained each other very well!Euan impressed her with just how much food he can eat!! Yet another hectic month! Santa featured quite a bit - he's a very busy man, as Euan saw him twice in one day at two different parties! We went down to the farm the Sunday before Christmas to go to the Christmas church service...Euan got bored and tried to escape halfway through. We also saw Uncle Brodies new sheepdog, Glen. He's a cute puppy but a little boisterous for Euan to play with. We also wished the farm turkeys 'bye-bye' on their journey to somewhere warm for Christmas! We must all have been good boys and girls this year as Santa came with presents to our house on a snowy Christmas Day. Euan has had great fun playing with all his new toys. Good news for Mummy this month as she discovered that she had passed her Open University exam - yipee! Hopefully only one more year of studying to go.